I’ll start by saying this: I have only very recently become fully vegetarian, but some of these thoughts have been brewing for many years. I need to organise these logically for myself, and of course I do this best through writing. So why not share this with the world? I invite anybody to share/comment/email me with their thoughts, suggestions, or criticisms. I always try my best to be open to sharing ideas and knowledge, bearing in mind that my opinions might not always be correct/unbiased. I have tried to be as least offensive as possible in this post, considering all on either side of the fence. I refer predominantly to vegetarianism throughout – perhaps this in itself is ignorant, and at a later date I might further develop my ideas on veganism. With the vegetarian and vegan movements at an all time high in many of the more developed cities and areas I’ve been visiting, and with having the time to educate myself in many different areas since I have been abroad, I have been forced to reassess the state of the meat industry and how this affects me. For most of my life, I have shied away from meat. In the first half of my years this was because I simply (some would add in luckily) did not enjoy its taste in most forms, unless it was in tiny pieces and drenched in additional flavour. In the next phase of my life, this has been coupled with the fact that I have become very aware of where meat comes from, and in what manner it has typically been treated from birth to death. In the past 6 months for all intents and purposes I have been vegetarian. I have had the occasional 2am burger after a big night out – and this has been when my mindset has been less than ideal. In such times I have favoured a craving for fatty food in its familiar burger-shaped form and (meat marinade) taste over thinking about ethics. It is also in these situations that I have poisoned my brain with alcohol which has lead me to such a (arguably selfish) state. I am learning more every day and am pushing myself to further develop my ideas about a more ethical lifestyle. In the past two weeks or so, I’ve ended up being fully vegetarian. I am now at the point where I firmly believe that a least a reduction in meat intake is a global necessity. In this post I will be documenting my thought process that got me to this point. I invite you readers to consider the angles that I propose, ultimately hopefully leading to a reduction in your own meat intake. 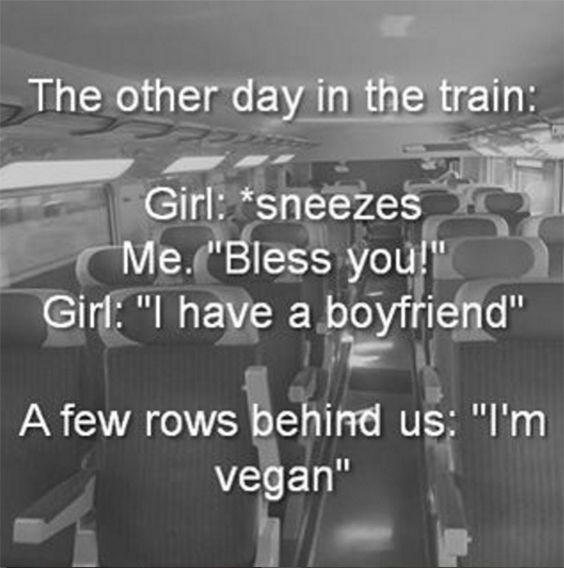 One of my all time favourite vegan jokes! I think that in some ways, humans today still hold somewhat primitive ideas of what should be valued. It’s only a matter of time before these things get phased out, like many have already throughout the years. Have you ever questioned why you wear earrings/necklaces/grow your hair long if you’re a girl? Why you value diamond rings and wear them on a specific finger for marriage? Why you believe in marriage at all? I won’t get into that, but these are all examples of things we have been culturally conditioned to believe in and adopt in our lives. It doesn’t make them intrinsically right (or wrong) – they are just cultural traditions that are still being passed down. For all of the amazing technological and medical advances we have had in the past century, there is still a way we have to go for some cultural norms to be eliminated. Do we still throw twins into bushes because we believe they are evil? Do we burn left-handeds at the stake? (Luckily not for my sake!) I think that wearing animal fur, putting the hunted’s heads on walls of homes, and other related acts are very outdated ways of people trying to communicate their wealth and power; their dominance over (other) animals in particular. Wouldn’t it be beautiful if people could rather communicate their value using the beautiful cerebral power that we have developed – showing their integrity, intelligence, interesting theories and debates through conversation and action? Now with this in mind, we need to further look at animal ethics, the meat industry and the vegetarian debate. I have never really liked the taste of meat itself. Before you think “Okay, going to stop reading this now because I love its taste,” consider this: is it the taste that you like, or its accompaniments? Do you like the taste of a steak because of its marinade and the smoky flavour that it gets from the cooking process (all things which can be applied to vegetarian options too); is it maybe the texture that you really enjoy, or the actual taste of the meat? Something I have found so often is that I have enjoyed meat dishes not because of the meat itself, but because of what it is cooked in and/or served with. I have often said this to people recently, and not all but certainly many have considered this argument and come to agree. Yes – but I can almost guarantee that a higher percentage of meat-eaters are overweight when compared to the vegetarian population. I do acknowledge this might not come from eating meat itself, but rather from the other “unconscious” lifestyle factors such as drinking and smoking that often come with an “unconscious” meat-eating diet. Regardless of the reason, vegetarianism isn’t a lifestyle one should necessarily adopt simply to be healthy – to me it is fundamentally about animal rights which is covered in the next argument. On a somewhat contradictory note, one thing to add here is that I have seen often that resistance to vegetarianism comes often not just because of the giving up of meat, but sometimes people associate the lifestyle with being “too healthy and not balanced.” They automatically assume it might be very difficult to give this up and would simultaneously be forced into an extreme lifestyle of clean living. This is certainly not necessarily the case. I once saw the following t-shirt and for whatever reason, it had a big impact on me. 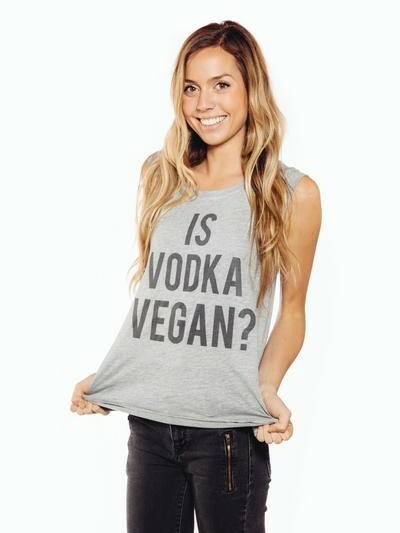 PS – The answer is yes! Although I’ve done a fair amount of research, I cannot say conclusively whether we have evolved to eat (and require) meat or not. However, I don’t think this is very relevant to the angle of my argument. You can watch as many documentaries about animal rights, as many stats on the world’s resources, as many powerful cartoons, and as many scientific studies as you like – and still later in the day eat a burger. Shock advertising has been proven to be an ineffective way of changing behaviour. Do you think that most people who chain-smoke don’t know that cigarettes are full of chemicals and lead to an exponential increase in their risk of cancer? Of course they know – but their destructive behaviour continues. Shock advertising may be effective at times, but I think for the large part it is not. You can close your eyes (if you are already partially “awake” to this matter) and tell yourself “I’ve been eating this forever – what harm will one more steak do?” or “My body physically needs meat, because it has always been in my diet and/or because I am naturally an omnivore,” or “It is simply my culture” – an argument I have heard too many times in South Africa – but none of these change the fact that as it is right now, animals are being unethically bred and slaughtered purely for human consumption. I think that this needs to be at the core of the vegetarian fight. It doesn’t matter if it’s natural to eat meat, if you need protein, or if your traditions or religion support it. The way the world is today, for all of the incredible things going right in the world, animal farming is not one of these. I don’t think that my need for protein can justify the method in which animal protein gets on my plate. Again, I agree that jokes like these are very funny. But they are certainly not a legitimate argument for eating meat in today’s world. 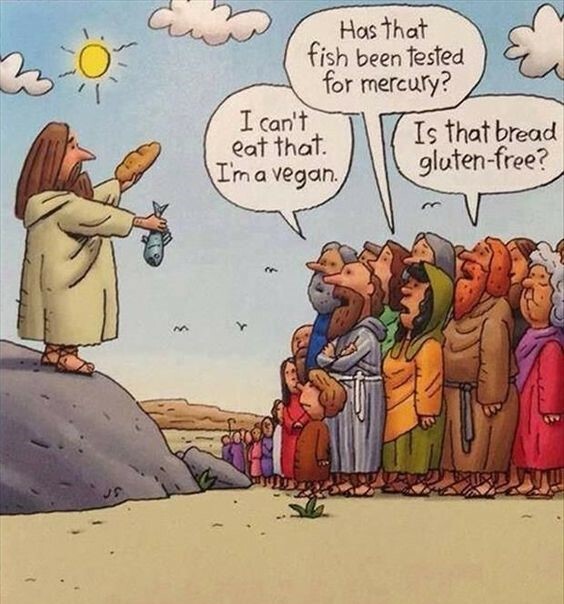 Whether religious or not, in the times that this cartoon is referring to, meat would have been farmed for subsistence. I’ll be honest and say that the closest justification I can think of for humans eating meat would be if we lived like they did centuries ago; hunting animals and killing only when necessary – just like as is still currently done in the wild. A former boyfriend of mine used to farm rabbits. It was interesting to watch some of my family and friends’ reactions to this; often they were negative. None of these people were vegetarians themselves, but they thought it was pretty much barbaric of him to be killing animals with his own hands – especially cute little bunnies. He held the belief that what you eat on your plate, you should be able to slaughter yourself and prepare to the point of being ready for consumption. I firmly agreed with him – and knowing I would never be able to do this myself, it was this that got me seriously considering vegetarianism. The world is not going to become vegetarian overnight. It might not even have to ever go vegetarian if practices became more ethical and were scaled down to a subsistence farming level (I know many veggies might disagree here however). But the fact of the matter is that in my lifetime I am highly skeptical that large animal farming industries will ever become ethical, and therefore I have made the choice to not support these. What do you think?